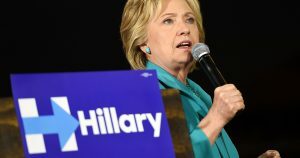 On Wednesday, Democratic presumptive presidential nominee Hillary Clinton will not be campaigning in any swing state. She instead will be safely in the Democratic friendly state of New Jersey. She will be there for just one reason – Donald Trump. During a campaign stop on Wednesday in Atlantic City, the former secretary of state is planning to assail Trump with accusations he has for years stiffed small business in the city while laying off thousands of employees through the failed businesses dealings he has had. Clinton is delivering a speech next door to where one of Trump’s casinos was shuttered. According to an official from Clinton’s campaign, she is to be introduced by someone in small business who was hurt in Atlantic City by Trump. The unnamed official said that Clinton will make the case that Trump is not fit to be the president based upon the destruction he has left in his wake due to fraudulent business dealings in the seaside city. The official added that Clinton will highlight the multiple bankruptcies of Trump in Atlantic City, which stiffed contractors along with creating many job losses. Ahead of the appearance by Clinton, her campaign released a new video on the Internet blasting the billionaire for his gamble in Atlantic City, in which her campaign said he earned millions of dollars while his companies went bankrupt. The video includes footage of a GOP debate when Trump was confronted over his losses from business and his history of filing bankruptcies. The video shows a key component of the argument of Clinton against Trump, which is that he, has always put himself as well as profits above the rest. The stop, which Trump-focused, arrives as Clinton was criticized sharply for using a private server for her emails while the secretary of state by James Comey the Director of the FBI, but Comey did not recommend any criminal charges be filed against her. That freed up Clinton of worrying about criminal charges, but left questions about both her character and judgment. The campaign stop, which has been long-planned, offers Clinton the opportunity to change the focus back on Trump to deflect the negative comments the GOP are making about her secretary of state tenure. Clinton and the Democrats are continuing to show that Trump is not qualified to lead the nation due to his previous business dealings.